Halloween can always be a little tricky (no pun intended), but it can be done! I am so excited about the Teal Pumpkin Project that people are starting to do. Its a great new tradition that those with and without food allergies can participate that can make Halloween a little less scary for kids with food allergies!I love that it promotes awareness, safety and respect for children that cannot eat many or all candies due to their allergies. Participating is simple! 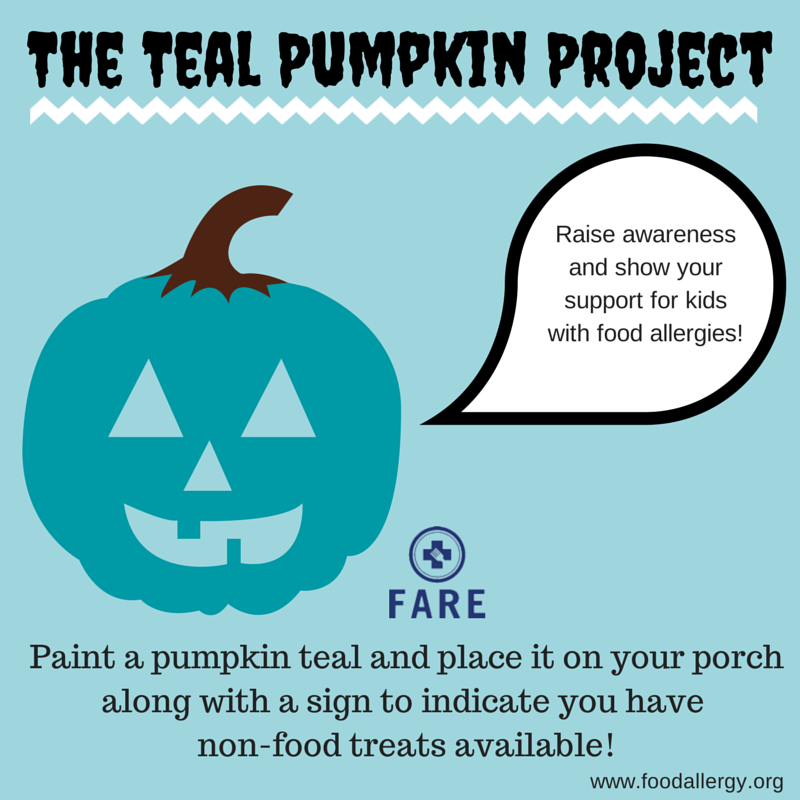 All you do is paint a pumpkin teal, place it on your porch and provide some allergy safe options for kids with allergies. You can also print out a sign from FARE (Food Allergy Research & Education) to place on your door to alert parents and kids that you have this option for them. Need some ideas for non candy treats? I found many at the Dollar Tree, Michaels, Target Oriental trading and Walmart. Oriental trading has some really fun things- lips with fang whistles, halloween mini rubber duckies, sticky toys, mini blow up balls, mini plastic pumpkins (idea of easter egg- they come filled with candy but you can remove candy and put a non food prize inside!, mini flash lights, and more! Now this post wouldn't be complete without a recipe, would it?! I am a huge fan of Caramel Apples, but Collins has never been able to eat them because caramel is basically butter, cream or milk and sugar. After a lot of experimenting (and failing), I am excited that I have finally created a very tasty and dairy free caramel sauce that is perfect for making Caramel Apples! Eeek! Line a cookie sheet with a silpat or parchment paper to prevent sticking. Wash and dry apples, remove stems and insert stick into the top of each apple. Combine all ingredients except vanilla in a medium to Large non stick saucepan (you can use a regular sauce pan, this just makes it easier) over medium heat. Clip the candy thermometer on the side of the saucepan so that it is constantly reading the temperature of the sauce.Turn heat up to medium high and allow mixture to come to a boil. Stir frequently. 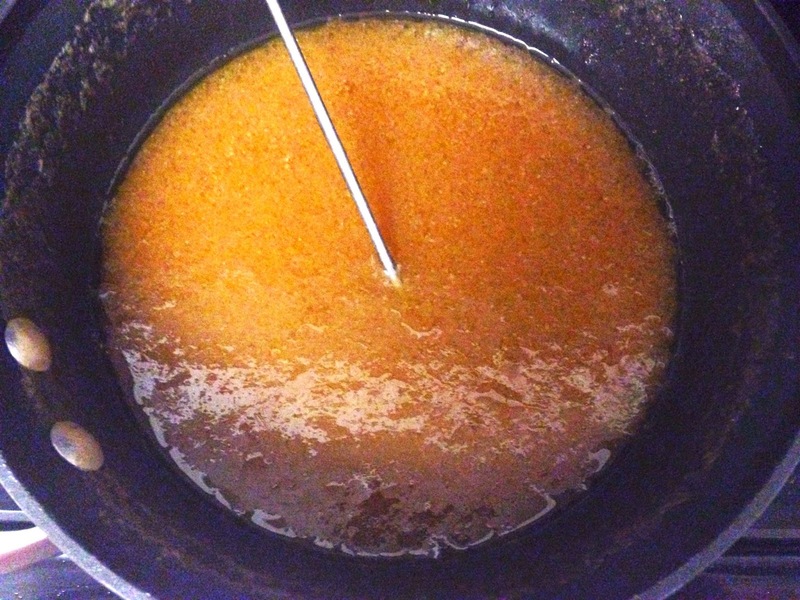 Reduce heat to medium or medium low (caramel will still boil once heat is reduced). Stir your caramel every couple of minutes or so and keep on medium (or med low heat) until thermometer reads 245 degrees farenheit. This will take around 30 min or so. Let caramel cool for about 2 minutes and begin dipping them! I also use a spoon to help the process. You will want to work fairly quick so that the caramel does get too cool and thick. Put each apple on the baking sheet, allow to cool for a few minutes and voila! Your apples are done! I like mine cold, so I usually wait a few min, pop them in the fridge for about 30 min and then eat them..but they are delicious either way! Store any leftover caramel sauce in a container and use for other treats. These will stay fresh and yummy for about a week in the fridge. Whether you have food allergies or not, these are sure to please! They are also much lower in fat and calories than typical caramel sauce because you aren't using cream and real butter! Another score! * Why use Cream of Tartar? it acts as a thickener for your sauce and keeps the sugars from crystallizing! I hope you and your families have a very Happy Healthy Halloween!